Close reading is a strategy that requires critical analysis of a short but complex text. A successful close reading lesson will scaffold student learning and focus on text-dependent questioning and interpretation. When participating in a close reading, students read the text three times. The first reading is completed independently, focusing on key ideas and details. The second reading centers on the craft and structure of the text, requiring students to listen as you read the text aloud. The last reading of the text can be done in groups or with partners. It should encourage students to synthesize and apply information from the text. Overall, close reading is a strategy that tackles a range of complex reading comprehension skills. The post below, although not exhaustive, outlines several of the benefits of incorporating close reading into your curriculum. Close reading is a natural fit for the Common Core State Standards. Each reading of the text focuses on a different layer of understanding and level of inquiry as described in the standards. For example, the first reading focuses on the goal of identifying key ideas and details. The second reading requires students to recognize the author’s use of craft and structure. Finally, the third reading of the text encourages students to dive deeper, integrate, and connect with knowledge and ideas presented in the text. In essence, the natural progression of a close reading mirrors the structure of the Common Core standards. Implementing close reading ensures a standards-based and multi-leveled approach to your instruction. As our classrooms become more and more diverse, the need for differentiation increases. 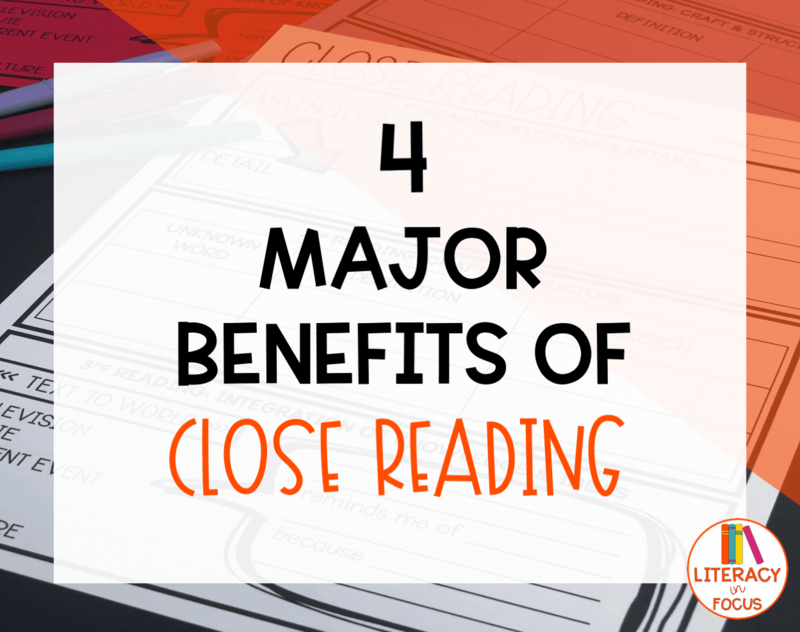 When it comes to meeting the needs of different types of learners, close reading doesn’t disappoint. First, the natural progression of a close reading lesson is scaffolded. Each reading of the text builds on skills mastered from the previous reading. Students have a chance to work their way through each reading, focusing on the full range of Bloom’s Taxonomy in thinking about and digesting the text. Second, text length can be altered to meet the differing needs of your students. For example, a low-level reader and advanced reader will examine the same text, but the length of the text will be different depending on ability. The inherent structure of close reading is ideal because it doesn’t require a separate lesson for each level of learner in your classroom. Scaffolding and differentiation are built-in components of the process. In order to challenge students and encourage critical thinking, the text you choose should require a fair amount of rigor. A successful close reading lesson requires high quality texts. You want to find texts that are short, complex, and lend themselves to the close reading process. First, assess the overall quality of writing and length of the text. Next, determine if the text is appropriate for your students by assessing the reading level and subject matter. Finally, make sure the text includes layers of meaning for a deep dive into synthesis and analysis. Ideally, you want to select a text with depth, potential for discovery, rich language, and room for interpretation. It is also important to remember your goal for the lesson. Make sure you choose a text that will lead students to the desired outcome. Backwards planning comes in handy for achieving this purpose. 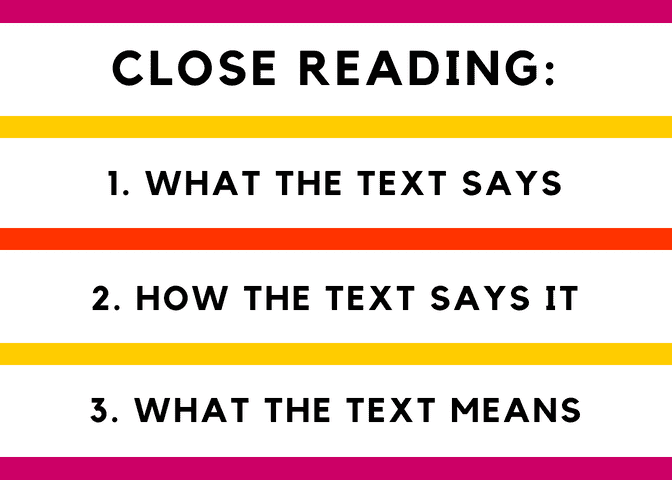 Remember, close reading focuses on three interpretative goals: what the text says, how the text says it, and what the text means. You want to select a text a that will allow students to work through each of the interpretive levels. Close reading can be applied across content areas and grade levels. It is a cross-curricular reading strategy that lends itself to many different applications. For example, a history lesson may include a close reading on the causes of the Civil War, an English teacher may use close reading to analyze figurative language presented in a poem, or a science teacher could implement a close reading lesson on one of the planets in the solar system. The possibilities are endless. Implementing close reading across content areas increases the instruction of foundational literacy skills, providing students with a stronger foundation for thinking more critically. 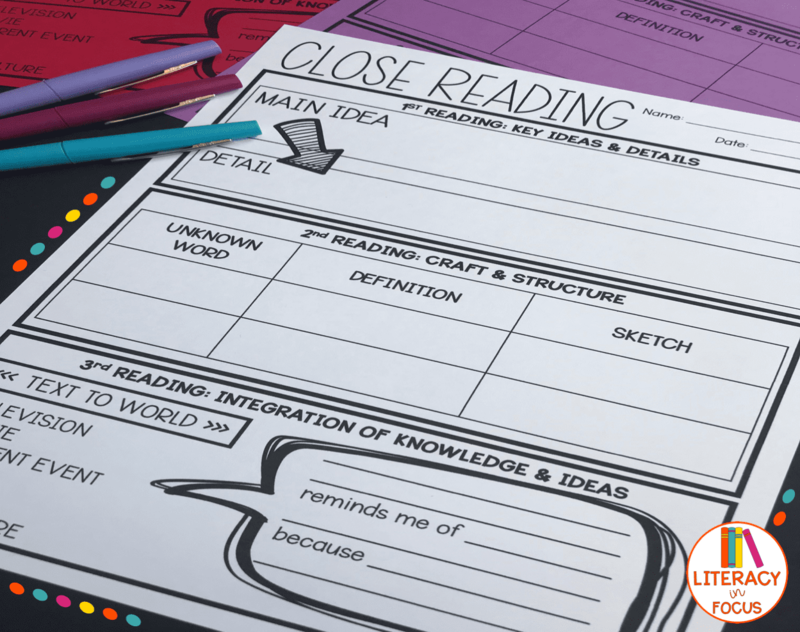 Visit the Literacy in Focus TpT store to download free close reading bookmarks and teacher’s planning matrix that can be used across all content areas. Hopefully, the four benefits listed above are reason enough to incorporate close reading into your instruction. If used consistently, you should see a dramatic increase in the reading comprehension skills of your students. 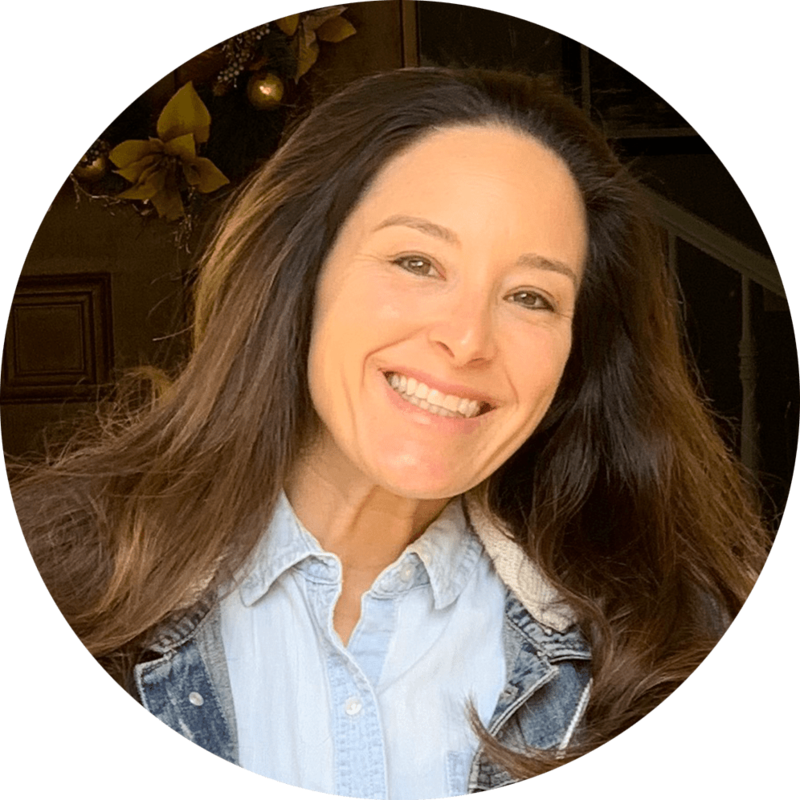 Overall, the goal of close reading is for students to be able to use close reading strategies independently in order to proficiently read and comprehend complex text. 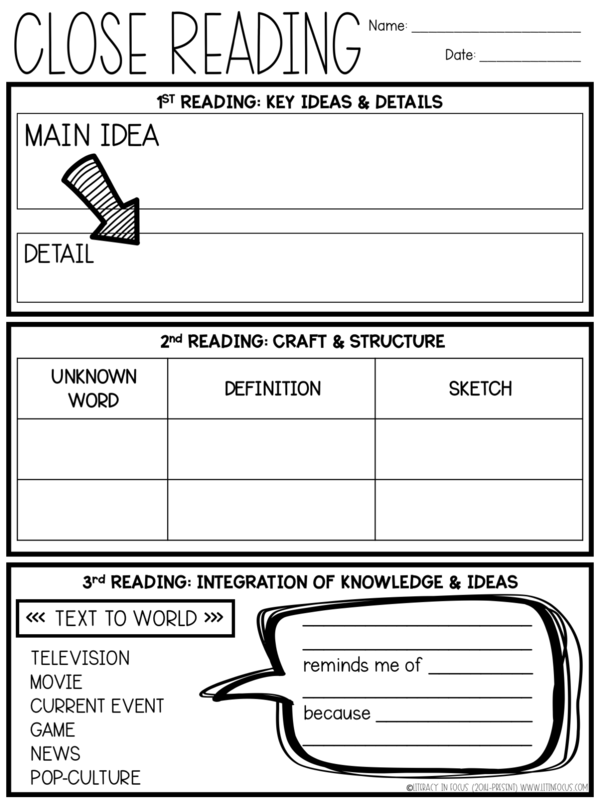 CLICK HERE TO DOWNLOAD THE FREE Close Reading Graphic Organizer! -What does close reading look like in your classroom? -Do you have any tips or tricks for other teachers who want to try close reading with their students? Success! The Close Reading Graphic Organizer is in your inbox!